onechild is the best way to document learning and build community at your centre. One Child is an Australian owned and operated business based in Brisbane, Queensland. We have been developing One Child since 2012 and started sharing our program with a number of local outside of school hours care centres around that time. In July 2014 we officially launched One Child and now have long day care, outside of school hours care, family day care centres throughout Australia and the world using our program, which we are very proud of. We created One Child from a need to make documentation easier for the National Quality Framework in Australia and to share great moments of child learning with parents. From then and from the feedback of our users, we have created an easy to use documentation system we know works and suits practically everyone in the industry. We believe “we don’t make One Child, you do!”. We really would like you to give it a go and join over 300 other centres who have signed up already. We feel confident that you will be delighted with One Child as your documentation system. Sign up now for free you will love it. Where are One Child’s servers physically located? One Child’s data is stored on servers in Sydney Australia to ensure that obligations to the Australian privacy laws for storing information online (Privacy Act 1988) can be met. What security does One Child have? One Child is a password protected website application. We use encryption algorithymns to protect your password. As all passwords are encrypted we cannot retrieve a forgotten password but you can easily reset it. We also use a 256 bit security certificate across all of our site. This is evident by the (green) lock on your browsers address bar and is the same technology employed by banks or websites where payments are made on a secure web connection. The certificate encrypts information which is sent from your device/computer to our server where information is stored. We also employ obfuscation techniques which essentially makes the interpretation of our stored data difficult to relate back to a user. Our servers are protected by a number of other security features including firewall technology and regular scans to detect viruses and malware etc. How much does it cost to use One Child? You can view our current pricing on our pricing page. We keep our pricing as low as possible and as part of this we do not charge per child like our competitors. We charge a flat monthly fee which will allow you to add all your children in care without going over budget. We also have a flat monthly fee for family day care providers as well. You can also sign up for a Free Trial with no obligation, no hard sell and no pre-payment. Do I have to sign a contract which locks us in? There is no lock in contract to sign. You can cancel your use of One Child at any time. Yes we sure do. The free trial is two weeks but if you need longer we are happy to negotiate an extension. We encourage everyone to try out One Child to see if it fits your needs. The free trial is on our live system so if you do get started during the free period all your work is available to just continue on with. Do I have to add my framework to One Child? In all likelyhood you do not have to add any National Quality Framework. We currently have these curriculum’s ready for you to select from. You can select one or several of these. If you have your own you can also add a custom curriculum. There is no limit to what you can add. The selected curriculum is then available to link to your learning stories or planning with just a check of a box. Really simple and easy! What devices can I use One Child on? You can use any device which is connected to the internet. This means that you can use an Apple iPad or phone, Android tablet or phone, a desktop PC or laptop. You do not need to download anything and can access One Child from anywhere in the world. 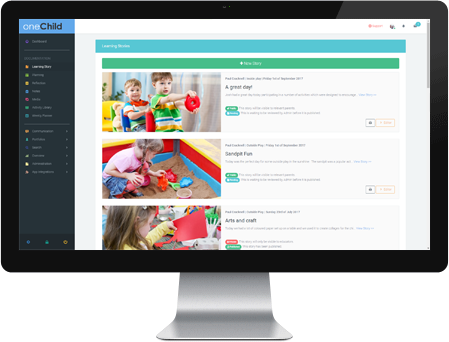 The best way to see all the great features One Child has, is to sign up for a free trial. So Easy to Use, its Child’s Play. See how easy it is to create a learning story for a child, add photos, learning outcomes and share with parents. You will LOVE One Child, here’s why! Be more productive with recording learning stories, planning and reflection. Our documentation system is so easy, you will wish you started sooner. 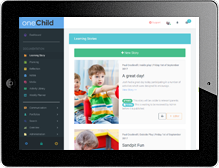 Share learning stories photo’s, video’s and PDF’s privately with families instantly with their own login and secure child portal which can be accessed at any time, any where. Connect with your community effortlessly. Keep parents up to date with what their child is doing in your centre. Send messages, make announcements and start a conversation with comments. View all documentation for any child, in any year, quickly and easily. Monitor centre progress throughout the year. Generate reports on learning outcomes, planning, observations and reflections. Stay in control with a range of administration tools giving in-depth insight into a centre’s documentation practices. One Child looks great and is easy to use on any device from desktop to tablet or even on your smart phone. Educators Love using One Child and you will too. We know that One Child makes the process of documentation easier and gives you back more time to do other things. Don’t just take our word for it, this is what some of our educators have to say. I am really happy we found One Child, being a large service it was difficult to keep track and document every child effectively, but that has all changed now. There is also great support and training provided. I use “One Child” and find it easy to use and a helpful tool to make my job easier . All the information you could ever need is at your fingertips and it is far quicker than the old fashioned pen and paper method . As the educational leader for the centre I can use the review functions within One Child to provide direction and feedback to each educator around their programs and documentation, to develop training programs and alert educators to learning opportunities for particular children or groups of children. Using One Child to create links between an educators planning, observations and reflections is an efficient means to ensure educators practice is responsive and reflective of the children in their care.